Six days after setting my PR at the ING NYC Marathon, I did the Mud Run at McGuire Air Force Base with a group of avid runners. Thanks to Bill for suggesting this race! This is a first for the event and it was great – 6.2 miles of mud and sweat. The 10K course encompassed different types of terrain, including asphalt, dirt, hills, water hazards, a jaunt along the tarmac, and of course, mud! 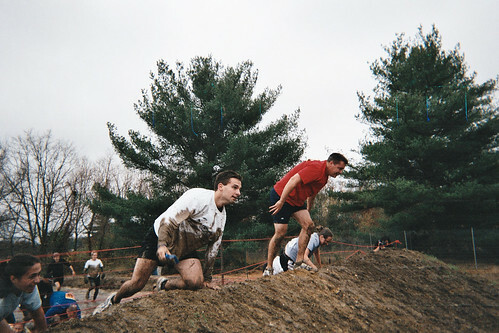 There were mud pits, rope climb walls, belly crawls, a tire course, wall climbing, creek traversals and more. It’s the most fun I’ve had at a race. I am definitely doing this again in 2009! I completed the ING NYC Marathon yesterday with a finish time of 3 hours, 16 minutes and 58 seconds. This is my best finish time for a marathon, an improvement of about ten minutes over the last NY Marathon I did in 2006. In the spring of 2008 I ran the NJ Marathon in Long Branch with a finish time of 3:46:28, so my time in NY is actually a 30 minute improvement in a harder race, just seven months later. It’s finally here. Tomorrow at 9:40am is the start for the first wave competitors in the ING NYC Marathon. I’m running in the first wave, race number 8025. My progress can be monitored real-time here: http://fanalert.ingnycmarathon.org/Alerts.aspx. I believe this has been my best training season. I ate much better this season (including more protein). I did every training run on my schedule and really worked hard during the speed workouts. I also did lots of cross training on my non-running days — much of which was core training. I also stayed mostly injury free. I have a minor shin splint which I’m hoping won’t affect my performance — usually I don’t feel the discomfort until after the race. The weather looks good for tomorrow and I’m all packed. I’m heading off to the train station now. ING — here I come. You are currently browsing the Sconzo.com weblog archives for November, 2008.